Despite the wealth and breadth of scholarly engagement with theme parks, especially over the last two decades, issues of time and temporality in theme parks have so far been comparatively neglected. Time and Temporality in Theme Parks addresses this gap by looking at theme park temporalities from a number of distinct perspectives. Contributions come from a wide variety of academic disciplines, including anthropology, history, American studies, archaeology, geography, sociology, and theater studies. These scholarly perspectives are complemented by contributions from writers with a background in theme park design and industry. 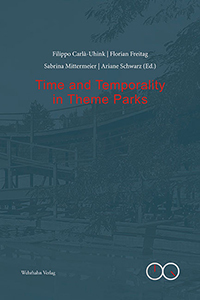 Addressing the conceptualization and creation of theme park times in general, as well as topics such as heritage and retro-futures in particular, Time and Temporality in Theme Parks seeks to give both scholarly and non-scholarly readers a comprehensive look at the multiple roles time plays in the theme park. The editors of this volume are the members of the research group »›Here You Leave Today‹: Ästhetische Eigenzeiten in Themenparks« (»›Here You Leave Today‹: Aesthetic Proper Times in Theme Parks«), based at Johannes Gutenberg University Mainz (Germany) and funded by the German Research Foundation (DFG). The group is part of the DFG Schwerpunktprogramm (Priority Program) 1688, »Ästhetische Eigenzeiten – Zeit und Darstellung in der polychronen Moderne,« which studies temporality in its cultural and historical ambiguity.